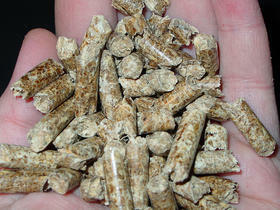 Georgia ranks third in the nation for its conversion of woody biomass (here, shown as wood pellets) into renewable energy. The pellets are burned to create steam and electricity. After a timber company makes its plywood or paper, there’s leftover sawdust and wood shavings. These leftovers are called woody biomass and in Georgia, they’re becoming a big source of renewable energy. A Pew study ranked Georgia third in the country for converting this “woody biomass” into electricity. Trees are a big deal here. “We lead the nation in the production of telephone polls. We have the largest hardwood sawmill in the United States. We have the largest recycled paper mill in North America. We have the largest wood pellet plant in the world,” says Risher Willard with the Georgia Forestry Commission. Georgia has the most acres of forest available for commercial use in the country: almost 25 million acres. That’s more than two-thirds of the state and more and more of our forests are becoming commercialized. That’s partly because Europeans want our wood. “You’re talking about big facilities creating these really dense pellets, because Europe has these huge incentives – government incentives – for woody biomass right now in their efforts to cut their greenhouse gas emissions,” says F.G. Beauregard with the National Wildlife Federation. In 2007, there were no wood pellet mills in Georgia. Today, there are 10. Risher Willard, with the Georgia Forestry Commission, says the industry is actually planting more trees than they’re chopping down. “Any time you have more forestry business that encourages landowners to maintain their forests rather than converting it to some other use, it is good, in my opinion,” Willard says. In 2012, the forest industry generated nearly $29 billion for the state. It’s currently the second largest industry in Georgia.